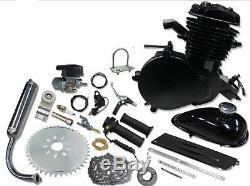 This motor kit looks similar to others, but this is the Brand New 2014 model 2-cycle engine kit with many improvements and enhancements which make it stronger, more powerful and more durable. And best of all, you can be assured that this engine ships from the United States! Easier to mount on fat-tubed bikes! 25 to 40 mph depending on the gear ratio and weight. Independent drive sprocket and chain - does not interfere with your current drive chain and peddling. Comes complete with everything needed to mount to your bike - you can be riding the same day it arrives!! Black Slant-Head Motor 66/80cc 2-Stroke EPA Engine 2. High Quality Japanese Main Bearings 7. Chain Tension Guide with Bearings 9. Upgraded Alloy Push Clutch Lever 13. Upgraded Twist Throttle and Cable With Grip 14. Universal Mounting U-Bolt mount 15. Black Teardrop Gas Tank (2 Liter Capacity) 16. Large Spring (Heat Shield Spring) 23. Extension Spring (Recoil Spring) 24. High Quality Needle Bearings on Both Ends Crank 25. 44 Tooth Chrome Sprocket with 9 Holes 26. Bonus: Sprocket Removal Tool 29. Bonus: Spark Plug Removal Tool 30. All the Needed Mounting Brackets, Gaskets, and Hardware It only takes an afternoon to turn your ordinary bicycle into a motorized gas scooter using our complete ready to install bicycle engine kit. Most people can instal a motor kit in 2-4 hours. You will need some basic tools for installation. Fits Most 24 and larger Wheel Bikes (Mountain, Cruiser, Chopper, Road) with V-frame. Disclosure of accurate engine size: While we have chosen to use the long standing factory branding engine size of "80cc", the true displacement of the bicycle engine is 66cc. Down through the years China bicycle engine manufactures have advertised their biggest engine as 80cc, therefore we have listed them in the same way on our website. However, the bore and stroke of an 80cc being 47x38mm equals 66cc. Therefore the true displacement of the 80cc bike motor is 66cc. In the west, the volume of a cylinder is calculated by using the formula Volume = Pi x Radius Squared x Stroke. However, in the east the displacement of an engine includes the area of the cylinder head's combustion chamber as well as the volume of the cylinder. As such, there lies a discrepancy between measuring standards by the manufactures in China with those in the United States. As such, all "80cc" engine kits on the market today are actually 66cc in displacement size if measuring by US standards. The item "New 2014 ModelMUCH FASTERBlack 66/80cc Bicycle Engine Kit, Motorized Bicycle" is in sale since Saturday, August 27, 2016. This item is in the category "Sporting Goods\Outdoor Sports\Scooters\Gas Scooters". The seller is "bicycle_motor_works" and is located in Las Vegas, Nevada. This item can be shipped to United States.